Just blogging cause I want to show everyone a close colleague of mine's new-born baby boy. Riley Willam Stephens was born on 28th Jan 2009. He was just a little over 3kg. Meagan brought him in yesterday and everyone was going goo-goo and ga-ga all over him. He's just about turning one month old and like all babies was sleeping most of the time. 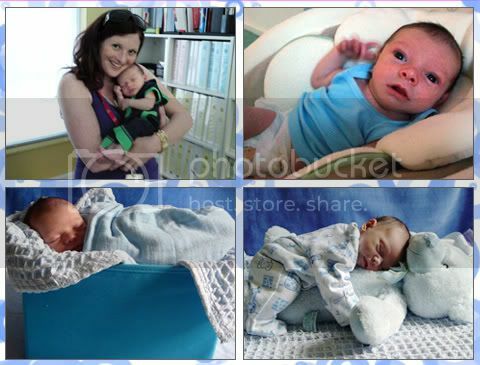 Anyway here's some cute photos of him, except for the top left hand one, the rest were all taken by his mommy. Look at the photos she took of him lar, so free yah! Can set him in a small box and lie him on top of his teddy bear etc, but how CUTE though! Even darling was saying how adorable he was. There were more photos, but I wasn't sure if I should put all of them up, so just picked a few. Well on to tennis lesson update at Clayton, it was good and darling and I have decided to continue taking lessons there. He even told me today after dinner that once a fortnight didn't seemed enough and that he actually feels like having it every week instead, haha. I guess we can work something out with the coach. Only down point is that the uni court rentals are pretty expensive at $14 per hour. Even as a member you have to pay. No doubt the rate might be discounted, but usually when you join other tennis clubs, you can play for free anytime. So boo to this down point. :( Anyway on the first lesson I was actually a bit uncomfortable with the coach as the previous coach actually let me explore other playing options like single-handed back hand. But the clayton coach said that woman usually don't do that as they need the power with both hands. So he kinda wanted to change me back to double back hand. So I'm still kinda like stuck in between both tactics but am glad he isn't too pushy and is slowly letting me adapt myself to the technique I much prefer. babe! sounds like you're getting a lotta exercise! woot! even though you think you're 'chubby', give it some time. and perhaps extra time on the treadmill will make a difference. ;)I havent been running either! have only gone once since returning! and man, i miss tennis! oh yes, i actually do eat faster than sisters here! :P unbelievable huh.